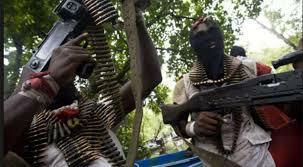 Unidentified gunmen yesterday kidnapped four Catholic priests, wounding others in a brazen broad day attack that has sent shivers down the spine of the survivors who were lucky to escape. Speaking with The Guardian on the condition of anonymity, one of the priests who escaped, said they were all returning from their annual class meeting that held in Warri between Monday, November 5 and Tuesday November 6, which incidentally marked their 10th year priestly anniversary. He went on to ask everyone to pray for their safe and timely release, adding that attacks of this nature against the Catholic church have become one too many. The priest said the abductors were yet to make contact, reminding, however, that the Catholic Church does not encourage payment of ransom to free kidnapped victims. The Police Public Relations Officer (PPRO) of the Delta State command, DSP Andrew Aniamaka, confirmed the kidnap but could not give further details. Aniamaka said it was not yet ascertained if the victims were kidnapped in Delta State or at Urhonigbe in neighbouring Edo State, adding however that investigation was in progress to unravel the circumstances of the kidnap and bring the perpetrators to book.